Since i got my Nokia N8, i have been exploring all the features it has, i never seem to have exhausted them. Save for exploring all the games it has on offer for download at the ovi app store like the angry bird @philipogola must be angry by now that he still doesn’t play that game as he waits for the Nokia E7 to be launched in Kenya later this year. 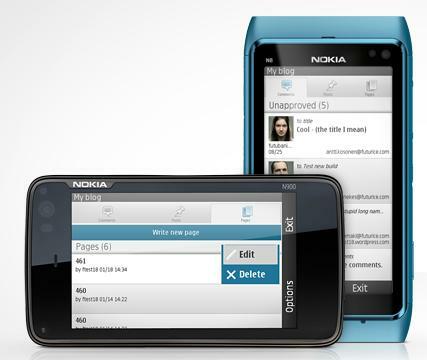 Today is when i decided to explore the WordPress for Nokia App. I tell you am the most amazed person now. You also would be if you own a Nokia smartphone, (Ok, no bias for other smart phones, the app is also available for blackberry, iOS and Android, no mention for windows phone ) but am focusing on the Nokia which i have. Now the WordPress app, now available for download in the ovi app store, allows you to edit your existing blog content, add new posts and pages, or simply manage comments on the go, WordPress for Nokia allows you to do it directly from your S60, Symbianˆ3 or Maemo-powered Nokia. The features it gives you are ability to do everything you need when writing a blog post such as this. With my Nokia N8, i can google the N8 image, crop it and add it in this post below here, see it. You can add pictures and videos from your computer to your blog post in a process as easy as click to locate and upload. As you all know your readers will like to see more images and good content to see the actual feel of what you are telling them, well unless of course you are John Grisham See the look in the backend. And next time some faceless guy decides to write about free phones, please enquire first what they are about. Tim Njiru is Nokia Brand Ambassador in Kenya, now you understand why he uses his Nokia to take pics?